Who doesn’t like shopping for new clothes? With the first day of spring well behind us, it’s definitely time to get busy cleaning out your closet and making room for new arrivals – and have we got some fantastic new arrivals for you! Our brand new Cupcakes & Cashmere marguerite citron dress is a preppy striped sundress that’s perfect for those steamy hot afternoons in June, July and August. Whether relaxing in a lounge chair by the pool or souvenir shopping on vacation, you’ll feel cool and cute in this adorable summer dress. While it’s perfect for vacation, this dress could also pair with a coordinating blazer for work attire. Featuring unique front-fastening straps, a V-neck and pinstripes in pale yellow and navy, the marguerite citron dress is sure to be a favorite addition to your summer wardrobe. For something a little more flirty and feminine, try our Cupcakes & Cashmere lilac dress. With a halter neckline and three tiers of ruffles, this lightweight dress will make you feel like you’re floating on air. The Cupcakes & Cashmere lilac dress makes a lovely piece for parties and weddings and you can easily pair it with sandals to dress it down or heels to dress it up. Amethyst or pearl jewelry will complete the soft, feminine look. 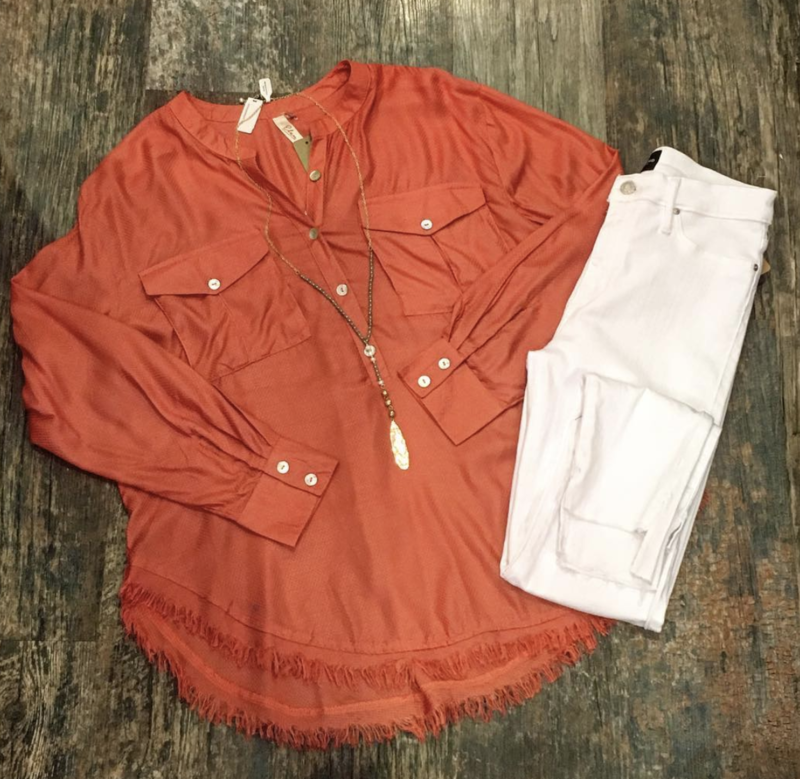 If dresses don’t suit you, our Sugarland boutique recommends this new Elan orange top and high rise skinny jeans by Black Orchid. You’ll glow when you wear this flirty orange top embellished with pearlescent buttons and finished with a fringe hemline. The Black Orchid white jeans perfectly contrast with the orange top for a stunning color-block look. Roll the jeans up for a more casual look and pair with ballet flats or sandals or dress the outfit up with white or orange heels. Breathe some new life into your spring wardrobe with these bright and cheerful new looks for Spring 2019. From classic pinstripes to feminine ruffles, Scout and Molly’s Sugarland boutique has something cute and cool to suit every style and personality!